The Valencia electro-acoustic classical guitar with its cutaway design is a well-built versatile instrument that appeals to players of any level. 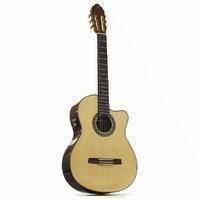 Valencia guitars provide instruments that will inspire many hours of playing, by ensuring a high standard of materials and production and this cutaway classical is no exception to that high Valencia standard. It produces a bright balanced sound and a natural-sounding amplified tone. With its 4-band EQ and tuner, this guitar also offers fantastic value guitar and looks to match with an attractive natural finish. The 18 fret fingerboard has 12 frets to the body with the single cutaway giving easy access to the upper frets. This Valencia nylon string electro-acoustic guitar is a solid performer with key qualities of easy playability and great sound.